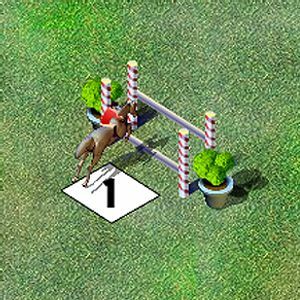 Play free Show Jumping Competition Online games. Use Arrow keys to move, Spacebar to jump. Show jumping is an action packed sporting competition in which horse riders jump over a course of fences, low walls, and other obstacles. The aim is to jump cleanly over a twisting course within the allotted time interval. Obstacles should be taken in the ascending order of their marked numbers. The number at an obstacle shows which side of the obstacle the horse should jump from. For every unclear jump a rider is incurred 4 fault points. Every second passed after the time is over adds 1 fault point to the score. A numbered box along the corners of the game screen shows the location of the next obstacle. Keep an eye on the tiredness bar at the top, if a horse gallops it gets tired quickly and a tired horse will trot. Also, remember that you can jump only when the horse gallops.